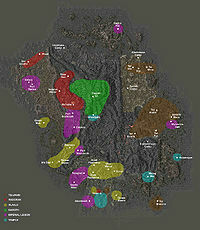 Areas of Vvardenfell controlled by House Hlaalu (yellow areas). Hlaalu houses and manors are often rectangular in style. House Hlaalu was one of the five traditional Great Houses of the settled Dunmer. It governed the Hlaalu District of western-central Morrowind from its ancient capital of Narsis. During the Second Era, House Hlaalu's presence on the island of Vvardenfell was limited to the port town of Seyda Neen; but by the late Third Era the house had a council seat located in Balmora, with other Hlaalu-run towns at Suran, Hla Oad and Gnaar Mok. House Hlaalu could be characterized as adaptable and opportunistic, and any morals they might have had came second to business. Early in the Fourth Era, soon after the Empire released Morrowind, anti-Imperial sentiment and House Hlaalu's association with them among the Dunmer led to the stripping of its position as a Great House, and House Hlaalu was removed from the Grand Council of Morrowind. Their position on the council was filled by House Sadras. The House was largely concerned with business and diplomacy, seeking to strengthen ties with at times unconventional allies such as the Empire, and although profit was often a primary objective, traditional Hlaalu practice recognized the value of a good reputation over money. This was their great strength - they were fast talkers and intelligent traders - and their great liability; most Hlaalu were bribable, either with gold or with other favors, with their leaders as no exception. House Hlaalu retainers were also masters of thievery, sneaking, lock-picking, blackmailing and backstabbing, both literal and metaphorical. While some councilors were honest and fair, others were more under-handed and corrupt. However, House Hlaalu's most distinguishing characteristic was its willingness to live in harmony with the other races, setting it apart from the other, occasionally xenophobic, Dunmer Great Houses. Hlaalu public buildings — tradehouses and craft guilds, manors and council halls — were designed as simple multi-storied buildings roughly rectangular in plan, featuring arched entrance-ways and modest decorated exteriors. More modest one-story private dwellings followed the same plan, except with less decoration. Hlaalu plantation estates resembled Temple compounds, with walled precincts enclosing outbuildings for craftsmen and servants, dominated by a grand manor residence in place of a Temple shrine. Although it considered itself to be one of the original Great Houses of the Dunmer, House Hlaalu was historically rather insignificant in the set ways of Tribunal-ruled, pre-Imperial Morrowind. Its holdings were centered around the ancient capital of Narsis in the southern-central region of Morrowind, on the fertile Deshaan plain. House Hlaalu's influence and wealth changed rather dramatically after the Treaty of the Armistice was signed at the end of the Second Era. During the Tiber Wars, which led to the foundation of the Third Empire, House Hlaalu was alone among the Dunmer Great Houses in proposing accommodation to the massing Imperial legions rather than resistance. After the Armistice was signed, the ruling Lord High Councilor of Morrowind, a member of House Indoril who refused to accept the treaty, was assassinated, and replaced by a Hlaalu noble. Furthermore, the role of the figurehead Sovereign of Morrowind was also filled by a Hlaalu; first Queen Barenziah, and followed, after her abdication during the Imperial Simulacrum, by her uncle King Athyn Llethan. After Llethan's death, the ambitious and ruthless Prince Hlaalu Helseth of Wayrest took the throne. When previously Temple-owned land on Vvardenfell was opened up for exploration and settlement in 3E 414, Hlaalu managed to grab the lion's share of the best lands in the fertile Ascadian Isles, and also got awarded the charter to the rich ebony mines in Caldera. Vedam Dren, another well-known Hlaalu noble, was the Duke of the Imperial District of Vvardenfell at the end of the Third Era. House Hlaalu was, on the surface, the most in favor of the Empire of all Great Houses, with allies in all the Imperial trade guilds. These titles and close connections to the Empire and the East Empire Company didn't stop members of House Hlaalu from being involved in the smuggling and slavery business. Several key figures within the House held close ties to local criminal organization the Camonna Tong; the Camonna Tong's kingpin Orvas Dren was the brother of Duke Vedam Dren, and Orvas directly controlled two Councilors. While Vedam disapproved of his brother's activities he was largely powerless or unmotivated to stop them. Of course, the majority of Hlaalu members were unaware of the connection between their House and the Camonna Tong, and indeed hated and feared the syndicate - for the majority believed they were doing quite well from their trade with the Empire. Externally, House Hlaalu was strongly opposed to slavery, a stance likely encouraged by its relation with the Empire. 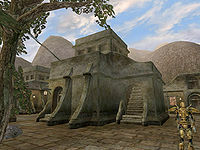 Despite this, because Morrowind was exempt from anti-slavery laws dating back to the Armistice with Tiber Septim, House Hlaalu used slaves on their plantations; the Camonna Tong also dealt in slaves via connections to House Dres. The Telvanni, however, had a generally low opinion of House Hlaalu, preferring Redoran's spirit and courage over Hlaalu's profit hunger and at times morally questionably dealings. However, despite Hlaalu's utilization of slavery, Ilmeni Dren, the daughter of Duke Vedam Dren, was not just an abolitionist, but a leader within the Twin Lamps movement. During the rise to power of the Grandmaster of the Vvardenfell House Hlaalu, the Cammona Tong were absorbed and eventually diminished by the new Grandmaster due to efforts aided by Duke Vedam Dren. Within the following four years, King Helseth formed an alliance with House Dres and renounced the slave trade entirely. Among the Great Houses, the Hlaalu were also the most friendly towards foreigners, outlanders and non-Dunmer in general. In fact, during the late Third Era, they were the only Great House to have non-Dunmer on their council: senior positions were occupied by two humans, the Imperial Crassius Curio and the Nord Yngling Half-Troll. House Hlaalu seemed to be on the rise, however the advent of the Oblivion Crisis in 3E 433 set events in motion that would see the downfall of the Great House. The Empire pulled a vast majority of the Legions out of Morrowind to deal with the gates opening in their homeland of Cyrodiil. The Dunmer had no standing army at the time, and were left defenseless as the armies of daedra swept across the province. While House Telvanni were able to close some of the Oblivion Gates, and House Redoran succeeded in creating an army, House Hlaalu was left powerless without the backing of the Empire. The events of the Red Year, 4E 5, brought further destruction to Morrowind as all of the settlements on Vvardenfell were obliterated. Shortly after the eruption of Red Mountain, Morrowind came under siege from the Argonians of Black Marsh, again being saved by the army led by House Redoran. House Hlaalu, due to their close ties with the Imperial administration, became the scapegoat for all of the Dunmer people's suffering. As a result, Hlaalu was unceremoniously stripped of its Great House status and dismissed from the Morrowind Grand Council. House Redoran became the eminent power in Morrowind, taking the position that Hlaalu had held throughout the Third Era. Hlaalu believe that Redoran were instrumental in the reorganization of the council, and have held a grudge ever since. In 4E 95, the Redoran Guard uncovered a Hlaalu plot to assassinate the Redoran councilor of Raven Rock. This town, and the island of Solstheim, were given to the Dunmer by the High King of Skyrim in 4E 16 as a refuge following the events of the Red Year. The coup was an attempt by Hlaalu to claim Solstheim from House Redoran, and to send a message to the Council that their new leaders were not as mighty as they purported to be. However, the conspirators were executed and the coup was quelled. For more information, see the Morrowind and ESO articles. ^ a b c d Adril Arano's dialogue in Dragonborn. ^ Lleril Morvayn's dialogue in Dragonborn. This page was last modified on 14 November 2018, at 16:28.